From August 22nd until September 22nd Enna Isilee at Squeaky Books is having a HUGE bash to celebrate her birthday! There’s a giveaway nearly EVERY DAY, tons of author interviews, and guest posts from some YA book bloggers. And I get to host a giveaway! 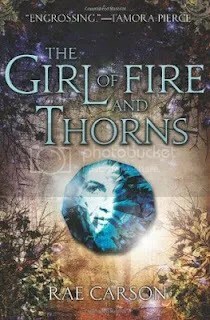 I’m giving away a copy of The Girl of Fire and Thorns by Rae Carson! Entering is simple, just fill out the rafflecopter. THIS GIVEAWAY IS OPEN INTERNATIONAL! You have until September 21st at 11:59pm EST to enter. All winners will be announced on Enna Isilee’s birthday (September 22nd) on Enna Isilee’s blog (Squeaky Books). And today, Ennalee interviewed Rae Carson at Squeaky Books. You should check it out. Without further ado, enter to win! Click below. Sarah- Yep, this books sounds great! I will hopefully have my review up before the giveaway ends. Hannah- Yeah I bought the book a few months ago. I plan to read it very soon. I've heard great things! This looks good..going on my TBR list!